Workflow at your document destruction business comes down to your jobs. Scheduling jobs with document destruction scheduling software regulates your workflow and gives you the space and organization to schedule more jobs and increase profit. When a new job comes up, simply choose the spot on the schedule you’d like to place it and begin filling out the work order. With QuickBooks integration, that work order becomes a ready-to-bill invoice at the end of the job. Life—and running a document destruction business—is simply easier with Smart Service scheduling software. When you are scheduling jobs, copying down customer details can be time-consuming and can potentially leave room for error. Because of Smart Service-QuickBooks integration, you don’t have to worry about that anymore! Simply type in a customer name or part of the address, and the rest of the customer data fills itself in. This saves time and money while preventing costly mistakes. With the Smart Service mobile app, dispatching has never been easier. If a new job comes up, you can even send it out to technicians on-the-go for them to accept or decline if their previous job goes over schedule, eliminating the need to call back and forth between technicians and the customer. When you are scheduling a job, simply assign it to a technician—or multiple! The schedule is color-coded so you can quickly locate the best technician to assign a work order to. Want to assign jobs close in location to the same technician? Smart Service can handle that too. 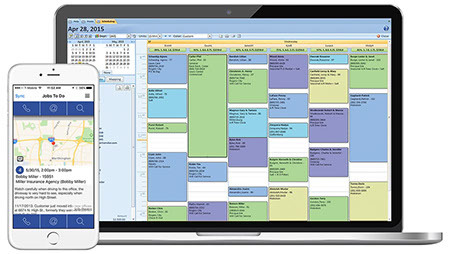 When your business operates outside of the office, you need a scheduling software that works outside of the office as well. Smart Service scheduling software equips your technicians with the tools they need to complete document destruction jobs the best they can. Customer information, previous job notes, pictures, and more are in the palm of their hands so that they arrive to the job prepared and ready for anything. Document destruction software takes your business to the next level. Request a demo today! Need a break from scheduling? Read these document destruction articles!